I have no idea what possessed me to make these cards. I cannot recall ever making a Halloween card before, although I guess we may have done at primary school as a kid. But certainly not in my adult card making history have I ever gone down the pumpkin road. It is probably as a result of blog hopping: seeing so many great cards and decorating ideas from the USA and Canada must have made a mark, and meant that late last night, as the witching hour approached, I just had an urge to make a Halloween card. But I have no stamps or dies for this subject. We really don’t do Halloween cards much here in the UK. Not yet, anyway. Then that tiny little bell rang. The bell I used to immediately recognise as a light bulb moment, a recollection, or inspiration, and now I just put down to possible tinnitus. ‘Go check your digikits’ it said. ‘You probably got something suitable in one of those bundle purchases you made’, it added, helpfully. Amazing how specific these voices can be! So, I did as instructed and found this really fab digikit from American Crafts called Nightfall. It is a mix between Halloween and general Autumn/Fall and harvest images. The voice was right – it was in a bundle of digikits I bought quite some time ago. I would probably never have bought it individually but it is jam packed with goodies that were just what I needed. Before I go any further I have to confess that I am a complete wuss when it comes to scary stuff. No word of a lie, until I saw ‘Sixth Sense’, Walt Disney’s ‘The Watcher in the Woods’ was the most scary film I had sat through from beginning to end. Many years ago, at the continual urging of a boyfriend I eventually tried to watch ‘The Omen’ but insisted on using my grandmother’s old black and white TV, which was tiny, and about 20 feet away. I still made an excuse to go make coffee when it came to the really scary bits. I am not constitutionally equipped for scary. This means Halloween card needs to be the chummy side of the holiday imagery. Oh, also I don’t cope well with spiders either. Webs are fine, because they are a thing of beauty, but their residents are NOT. If they are super-tiny, OK. Any much bigger than a finger nail and we are in heebie jeebies territory. Since we’re talking, another fear: collage. I may have mentioned before but for me, this is practically a swear word. I cannot do it; it will not and does not happen. I admire it, aspire to it, and accept it is pretty darn unlikely. Anyway. I was actually spoilt for choice with this digikit and love the little details that were included. I chose the images I wanted, roughly worked out the sizings and then printed out the elements to hybrid craft. Then I decided I wanted a flying bat. Well, of course! I searched again and found bats and hats in another kit of punches and stamps called Hallows’ Eve. So my cat has a hat and my bat is….stuck on to a strip of acetate and folded over the top of the card so he bounces around a bit. Close as I can get to him flying as I am not an aerospace engineer. Whilst not exactly (ok, maybe ‘remotely’ is a better word) collage, these cards do have way more going on than I usually add. I know this is a bit of a rush job, but I had such fun making these that now I would like us to celebrate Halloween rather more here! Interesting that there seems to be no consensus as to where the apostrophe should go in Hallows. I am staying well clear of that debate. 3D Thursday: home for the holidays? Week four of my 3D Thursdays. I wasn’t sure I would manage to keep it up, but I have stuck with it (sorry!) and am having fun making little glittery things. Well, today it is one very little, very glittery thing. I have used a Tattered Lace Shop die (bought last year) to make a Christmassy something. It could be purely decorative, or another Advent calendar piece, or even an alternative Christmas card or tree decoration. Firstly I printed out some music score from the Hearts and Roses Christmas digikit using Serif CraftArtist. With uncharacteristic foresight I actually thought about where to position the die, so I have musical notes in the right places, as opposed to featuring the gap between the staves. Hurrah! Next to crease and glue the shop (hereafter known as the ‘house’) together. I inked the house corners in silver to define them a bit more. For the roof I wanted a different colour and texture so opted for some silver glitter cardstock, cut to size, the edges trimmed with decorative scissors and then stuck over the existing roof. Like double glazing. Ignore the fact the windows are open to the elements. This is a house for tiny yetis. I also used the same scissors to cut slivers of glitter card for the base. The wreath is highly technical. It is made by twisting a silver pipe-cleaner around a pen to form the circle, dolloping on some tacky glue in a very heavy-handed way and then dunking in a tub of glitter a few times so it gets a bit clumpy looking, like wet snow. Mission accomplished! The finishing touches are a string of sticky pearls to gussy up the gable end and a banner greeting raised up on a double layer of 3D pads. Add one twinkly battery tea light and ta-dah! If you fancy having a go you don’t need a die to do this. There are plenty of free templates for houses available. You might even already have a cookbook with a gingerbread house you could use. If anyone does make one I’d love to see! I haven’t done this ‘sharing’ before so I hope I am doing it right! If not, feel free to let me know what I have done wrong. I thought this was a great idea and I know some of you out there write stories, poetry, draw, paint, design, do maths (! )… and might be interested. He’s a nice guy and his blogs are interesting and fun! The idea for this card came to me as I was falling asleep, which meant I had to get up and write it down as there is a strong likelihood I would have forgotten it completely by morning. Well, I would have been in that very irritating state of remembering I had a potentially good idea, but no clue as to what it may have been. I wanted to make a little snowy scene, kind of like you would get inside a snow globe. There are lots of examples of this sort of card on Pinterest and many of them feature a Santa and Sleigh die of some kind, which I do not have. I pulled out the two dies I do have which might work for this and cut them out to see what I could do. After a bit of faffing about (there is always some faffing about) I had a vague plan. I decided that my largest circle die could just fit over the trees on the Clearly Besotted Tree Landscape die (top one in the photo) so this would dictate the size of the scene. I cut the Avery Elle Falling Snow (not pictured) from black card, then positioned the circle over the bit I wanted and cut it out. I cut the Tree Landscape twice from white cardstock, giving me plenty of spare card to play with at the top and bottom of the image. Then I decided on the positioning, making sure I had two distinct layers for the ’hills’ and cut them out using the same circle die. I snipped one of the larger trees off the edge and stuck these two hilly layers onto the black circle with 3D foam. I added my spare tree back in the centre of the lower layer, also with 3D foam. I trimmed out just one of the houses from the Lawn Fawn Little Town border (bottom die in the photo) and stuck a bit of black card behind the windows so you couldn’t see the snow through them and then added a bit of Glossy Accents for more windowy realism!!! This house was then also added with 3D foam. Pretty location, nightmare for shopping and in peril of an avalanche. Insurance had better be up to date. The whole thing was then mounted onto a white circle of card to show up the snow and a banner greeting added. I can’t decide. Ribbon or no ribbon? Ever had to wrestle a card into submission? This has been one of ‘those’ projects. Theoretically whilst not being an easy victory, as it was familiar ground to some extent, or to keep the analogy going, an opponent I had fought before, it should not have been quite such an epic contest. I am still not sure if I have won on points or not. 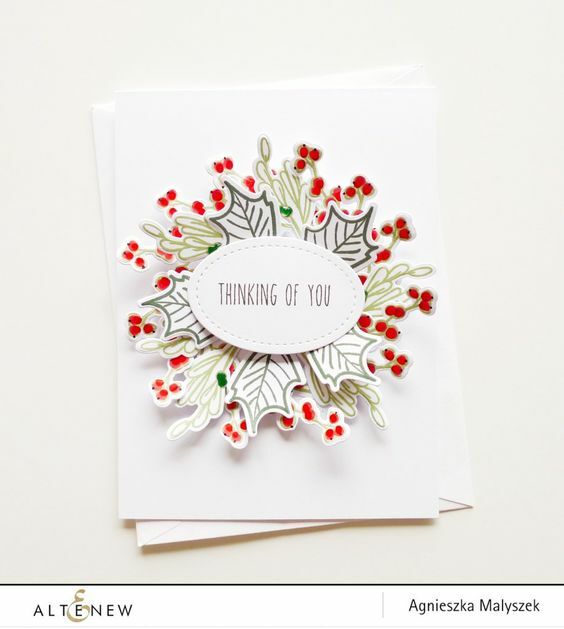 Whilst browsing Pinterest I came across this card using Altenew Poinsettia and Pine stamps, which I have. So the style was already familiar, I was just going to use different products. Now anyone who follows my babbling may remember that I cannot colour. To. Save. The. World. Seriously. If the Martians pitch up and the deal is a bit like Hunger Games, but a nice piece of artwork will send them away happy, just hope they don’t pick me in the colouring lottery. Otherwise, well, it’s been nice knowing you all. But, I can fill in a few berries with red pen, without hopefully affronting the eyes of those who can colour brilliantly, right? And maybe at a stretch just shade in the mistletoe leaves with a bit of green, perhaps? They are pretty tiny, so what can go wrong? The gold ink wouldn’t stamp too well. The gold glitter embossing powder therefore didn’t work brilliantly either. I switched to gold detail powder. I sneezed unexpectedly whilst holding the tiny open container and it went everywhere. Back to glitter powder then. I stamped the mistletoe over and over. Dandy. Alcohol markers – nah. All went too blurry as I didn’t have the right shades of green. Watercolour pencils? Couldn’t find them. That’s how often they get used. I settled for a squidge of the same ink colour mixed with water and sloshed on in what I sincerely hope is an artistic, informal way. AKA a chimp’s mum would be happy to use it as fridge art. By now I was eyeing the holly leaves with suspicion. I had learnt lessons. Just a stamped outline then. Fine. Although I couldn’t help but think they looked like the footprint of either a dinosaur or a duck. Maybe I had been playing with the alcohol pens too long. Fir sprigs next. These went well. Hurrah! Now for the greeting. I considered black, or red, but then plumped for gold. Another mistake, as I had forgotten the detail gold powder disaster of earlier, and the small words here work best with detail powder. There was, I confess, an undignified scramble to rescue enough of the scattered powder to emboss ONCE and once only. No pressure then. But it went ok-ish. Assembly time! I chose a satin finish base card that I have had for ages. Now I know why it has remained unused. The card is beautiful, no question, but it is a magnet for any stray speck of glitter or embossing powder. I gave up polishing it and decided they were now design features. Also, the card refuses to fold closed very well, and you can’t use a bone folder or it will mark the satin finish. Super! Two falls and a submission. I feel I should add a disclaimer here: I know nothing about wrestling. I might have got things mixed up with boxing in places as I am drawing on memories of Saturday TV as a kid. Sorry if I have been irreverent with anyone’s favourite sport!